No Vermont city's downtown has been transformed as dramatically as Winooski's. Over the past decade, multistory office buildings, a growing tech company and more than 400 units of high-density housing have replaced a moribund mall and its adjacent sprawling surface parking lot. The city has a new riverfront walkway, rearranged traffic patterns and 50,000 square feet of additional retail space. Winooski's redevelopment won a national Smart Growth Achievement Award in 2006. More recently, the city has become a food mecca, with a thriving restaurant row serving local brews and cutting-edge and ethnic cuisine. Young, hip patrons are all over "Burlington's Brooklyn." Now planners are turning their attention to improving the three main arteries leading into downtown, which is dominated by Vermont's biggest traffic circle. 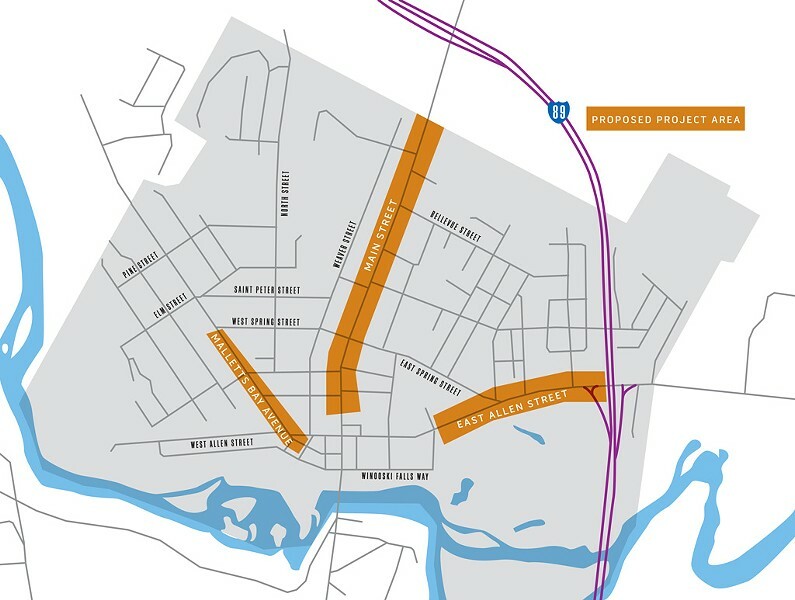 A six-day public visioning workshop that starts June 13 at the O'Brien Community Center will initiate the rezoning of some key feeder streets: most of Main and East Allen and about half of Malletts Bay Avenue. Three out-of-state firms are leading the sessions, at which various interest groups, including the public, will seek to collaborate and achieve consensus. This design "charrette" process was partly inspired by the one that resulted in Burlington's planBTV. The City of Winooski is paying for 20 percent of the $70,000 initiative. The Chittenden County Regional Planning Commission is covering the rest. The exercise is being carried out in accordance with a relatively new and trendy zoning precept known as form-based code. Several municipalities around the country, including a half dozen in Vermont, are at various stages of adopting this code, which places more value on the appearance of a new building and its relationship to the surroundings than its purpose. Conventional zoning, by contrast, seeks to situate new development in areas designated for specific activities — a shopping mall, for example, could add stores but not housing. The alternate zoning philosophy, developed in response to environmental pressures, aims to integrate various uses, with the aim of making communities more compact and less oriented toward automotive transport. The specific aim in Winooski is to give the three "gateway corridors" a more urban complexion — meaning fewer buildings fronted by parking lots. Each of the thoroughfares has them at present. Malletts Bay Avenue, for example, is home to an auto-body shop and the O'Brien Community Center, a repurposed shopping mall with a large lot. East Allen, aka Route 15, features two gas stations, a street-side parking lot for the Beverage Warehouse and an under-construction senior housing complex that looks as though it will be almost surrounded by parked cars. Main Street, which runs north-south, takes on the look of a suburban strip as it approaches the I-89 exchange at Exit 16. "What you see now on those streets is the result of traditional zoning," notes Regina Mahony, a senior planner at the Chittenden County Regional Planning Commission. Much of what's been built in the United States in recent decades represents "bad development," according to Ferrell Madden, one of the three planning firms overseeing the workshops. The zoning template devised in the 19th century to keep noisy, dirty commercial activities away from residential areas is now "unsociable, outdated and technically unsustainable — it is a practical failure," argues an assessment by the Washington, D.C.-based planners. "It results in ever-increasing traffic and congestion and threatens the very air we breathe." Adoption of form-based code in Winooski is unlikely to remake the gateway corridors in the image of downtown Winooski, says Mahony. "There won't necessarily be that degree of density and building height. Residents may not envision it that way." What's more likely is that the new plan won't allow new construction to be set back so far from the sidewalk. And an effort may be made to reduce the "jarring" visual and architectural contrast between the gateways and downtown, suggests City Manager Katherine "Deac" Decarreau, a Winooski native. In addition, "we have to make sure we have pedestrian, bike, bus through routes," she says, noting, "I'm personally a big advocate of light rail on the Route 15 corridor." Downtown Winooski is itself a product of a thorough zoning-regulation redo. And in the view of many locals, that has resulted in some clear successes and some glaring failures. Many pedestrians and drivers criticize the traffic circle in the center of the city. They regard its configuration as confusing, and at rush hour traffic backs up on all of its feeder roads. People on foot find it difficult — and dangerous — to reach restaurants on the opposite side of the circle. And the park in the middle of it gets little use. Still, the circle is "probably the most effective way" to handle the 27,000 cars a day there, says Eranthie Yeshwant, a consultant to the Winooski Planning Commission. Decarreau agrees, terming the circle "marginally better" than the four-way intersection that preceded it. The jury's still out on the Winooski Falls redevelopment area, site of the high-end Cascades condos and mixed-income Spinner Place apartments. Several of the ground-floor retail spaces are still vacant five years after they came on the market. And there's still no downtown grocery store, Decarreau observes, due to the lack of surface parking that supermarket developers regard as a sine qua non. For all its faults and ugliness, downtown's earlier incarnation did at least have that. Overall, "a lot of people are dissatisfied with downtown but for different reasons," reports Decarreau. "A lot of people actually hate what's happened and want to see it back the way it was. They want a mall in the mill," she adds, referring to the historic building and former shopping complex that is now occupied by the tech company MyWebGrocer. "They" might derive some comfort knowing the zoning rewrite for the three "gateway corridors" must pass through additional public hearings as well as reviews by the local planning commission and a final assessment by the city council. It won't be completed until sometime in 2016, at the earliest. Actual changes in the appearance of the gateways are expected to occur gradually and likely won't amount to much for another 20 years or so, Mahony adds. Any redo must take account of not only the physical but the demographic transformation of Winooski, Decarreau suggests. With 20 percent of its 7,239 residents listed in the 2012 U.S. Census update as of African, Asian or Hispanic descent, Winooski is the least monochromatic community in the state. It also has a poverty rate more than double that of Vermont — 24.1 percent vs. 11.6 percent. "The transformation of cities that we've been seeing is a wonderful thing," Decarreau says. "But you can't leave people behind. You can't just build high-end housing. You've got to have affordable places to live, too." In Decarreau's view, the makeover of the gateway corridors must not be "only about the look and feel of coming into downtown — it has to also allow for the kind of development we need." For details on how to get involved in the planning process, visit winooskigateways.com. The original print version of this article was headlined "A New Improved 'Noosk? After a Downtown Makeover, City Eyes Its Arteries"